Venue Initiative White Paper: Recommendations for Sports Venues is an evolving resource of peer-reviewed best-practice guidelines for venue owners, operators, developers, architects, and other interested parties considering a sports/entertainment venue new build or renovation project. 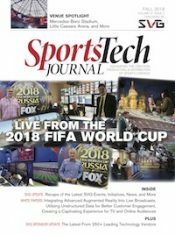 The Fall 2018 edition of the SVG SportsTech Journal featured a special Venue Spotlight section, which showcased the latest sports-venue news, including in-depth profile features on Mercedes-Benz Stadium, Little Caesars Arena, Coors Field, and Ford Field. What’s new in sports-venue technology at NAB 2019? Register for the NAB Booth Venue Tours. It’s the most efficient way to hear from the experts about exciting developments in venue production and the new technologies on display at the NAB show. This is event is only open to end-users of sports technology including: Broadcasters, TV Networks, Sports Leagues & Associations, Professional Teams Personnel, and College Sports Professionals. The SVG Venue Initiative serves the information, networking, and business needs of engineering, IT, and broadcast executives in sports venues – both professional and college – and provides a forum for stadium, team, league, and broadcast professionals to interact and spotlight venue best practices, technical hurdles, and trends.